Programs at The Sajni Center are open to families, regardless of income, who have children from birth to age 21 who have a life-threatening illness or chronic physical health condition not developmental in nature that affects a child's daily life or requires more frequent and intensive medical care than is typically required. Some of these diagnoses include: cancer, cystic fibrosis, sickle cell, epilepsy, diabetes, asthma, spina bifida, heart conditions, and severe depression. Siblings and parents/legal guardians are welcome to join programs, and childcare will be available on-site if needed during parent-oriented programs. How can a family sign up? All families must register online in order to participate. To receive the code to register, go to lucyslovebus.org/sajnicode. Program descriptions will list who the class is appropriate for; open to children with cancer or life-threatening illness and their siblings and parents. Advanced registration is required at this time. What is the cost of each program? Where can I see a calendar of programs? Dates for the programs are available at lucyslovebus.org/calendar. We hope to see you soon! Do you have another question? Please click here for our Sajni Center FAQs. Below is a list of programs that we ran/are running in 2018. Stay tuned for updates, and visit our calendar for current upcoming programs at lucyslovebus.org/calendar. The Adventure Gang is a fun, project-based support group for sick children and their siblings to gather and build community while working on a wide variety of projects and activities. This group is co-led by two Child Life Specialists, Kristen Goodhue and Cammy Adler. Children are welcome to attend each month, or to pick and choose the groups that look most fun. 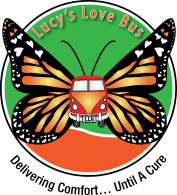 Suggested for ages 6 and up; please email beecher@lucyslovebus.org if younger children are interested in attending. June: Slime Time: Kids will learn how to make all kinds of slime and make their favorite batch of slime to take home. Have a favorite recipe? Bring it in and we can compile The Best of the Best Slime Cookbook! September: Kids in the Kitchen! Participants will learn how to make delicious smoothies! Each participant will vote on their favorite smoothie created and the winning recipe will be typed up for each child to take home. November: Comfort your soul! Kids can come and learn how to make a cozy fleece blanket while discussing what comforts them during difficult times. Barn babies will be bringing 20 baby farm animals for children to snuggle and love. Event will be held outdoors next to The Sajni Center, and will be moved indoors if weather doesn’t cooperate. We are able to accommodate children on restrictions in a separate area. Join us for a 90-minute gentle, soothing yoga session designed specifically for bereaved parents and siblings. No experience is necessary. We will provide yoga blocks, bolsters and blankets. Our instructor will lead us through easeful postures that are gentle and relaxing, inviting a calm mind, and respite from stress, sadness, and tension. The goal of this monthly program is to provide a safe, supportive oasis for families coping with the loss of a child. Participants will be welcome to stay after the class to talk and connect if they so wish. Join meditation instructor, Lisa Dorval, for lessons in freeing the mind from thoughts, worries, and fears through the practice of guided mindfulness meditation. This class is a must for our families who are coping with long-term stress and uncertainty. This program is for all parents and caregivers, bereaved parents, and children/siblings 14 and over. No experience necessary. Join us for community acupuncture sessions with Abigail Klerowski, L.Ac. Using Traditional Chinese Medicine, acupuncture, and her Western medical training, Abbi supports the release and management of both physical and emotional pains. By breaking this cycle, individuals are able to find relief, take control of their lives, and move forward. Acupuncture can decrease pain, increase mobility, reduce stress, improve sleep, help with anxiety management, ease digestion, and decrease dependence on medication. Our group acupuncture program is open to Love Bus children (with medical permission) ​and their immediate family members, ​as well as bereaved parents and siblings. ​Please w​ear loose, comfortable clothing and eat something one hour prior to your arrival. Group Limit: 6 participants. A gentle, slow-paced, restorative yoga program designed for children and families to support rest, deep relaxation and stress management. Sarah Oleson will lead the group in resting, easeful poses, while a Reiki Master offers Reiki to participants who want it during their restorative yoga practice. No yoga experience necessary. Recommended for ages 8 and up. Essential Oil Workshops: Come explore the wonders of essential oils with Catherine DeBrocke Kulik! Limit: 16 participants. Plant Power Workshop: What are essential oils? Where do they come from and what do they do? In this workshop, we will explore how pure, organic, therapeutic essential oils can be used to support the body, mind and spirit. Each family will have the opportunity to mix up essential oil based products to assist in uplifting mood, alleviating feelings of stress and restlessness and promoting digestive comfort. Lotions and Potions Workshop: This workshop will dig a little deeper into the world of therapeutic essential oils and how they can be used to support the body, mind and spirit. We will roll up our sleeves and mix up lotions and potions for skin and body care. See how simple and effective it can be to make soaps, balms, sprays and bath salts infused with pure organic plant power and gentle ingredients. Everything you see around you is vibrating at a frequency, whether we hear it or not. Sound frequencies can affect us on a cellular level, and influence how we feel and function. Sound healing practices like deep gong meditation uses vibrational sound and frequency to help reduce stress, alter consciousness and create a deep sense of peace and well being for better health. This program is open to adults and children, 14 and up. Click here to apply for the code, or click here to register! Day of Beauty for Kids and Caregivers: Hair and Eyebrows and Make-up… oh, my! Come get your gorgeous on with our amazing volunteer team of hair and make-up professionals just in time for Mother’s Day!! !